Long before the Delaware Law School hallways and parking lots filled for the start of the academic year, 33 first-year students were on campus getting a head start on their law school education. The Summer Advantage Program allowed the students to move onto campus in June and complete their first three credits before the fall semester began on August 20th. The students took Family Law taught by Distinguished Professor John Culhane. Students who successfully complete the summer program can position themselves to gain practical experience earlier in their law school careers and can either graduate in a shorter period of time or lighten their course load for one semester. The newest class boasts 218 students – 180 day students who complete their studies in three years and 38 evening students who complete their studies in four years. Students hail from 15 states and one student is from China. They represent 90 colleges and universities; 49% of the new students are female and 24% are diverse. Three branches of the military are represented in the new class as well. Thirteen students are classified as active, reservists, or veterans of the United States Army, Marines, and Air Force. 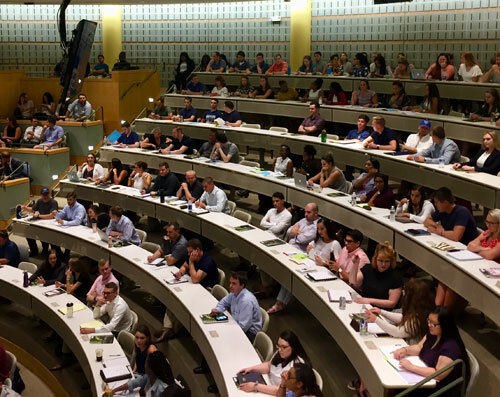 First-year student orientation took place over three days and featured instruction designed to help students achieve success in law school. Topics ranged from active reading strategies, case briefing, and note taking and outlining – all skills that are different in law school from undergraduate school. Students also attended sessions addressing professionalism and the character and fitness standards of the profession.